We have never hired a marquee before, what should I do first? 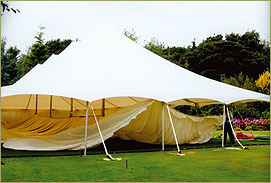 Are your marquees strong in bad weather? How long do you take to put the marquee up? Can you put up a marquee on any surface? The date of the event, the number of people attending, the kind of event you wish to hold and where. Should we consider it necessary, we will carry out a no-obligation site assessment. We will then provide you with a quote based on your budget and the details that you have given us. All our marquees are designed to withstand extreme weather conditions and operating in North Yorkshire we have been tested! For a wedding reception you need to have at least one full day prior to the day of use to organise flowers, caterers to lay up etc. 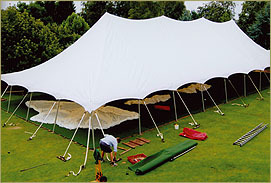 However, the day we put up the tent will depend on the weather, the size you require and the nature of the site itself. For use on Saturday we would expect to finish putting up your marquee by Thursday evening. 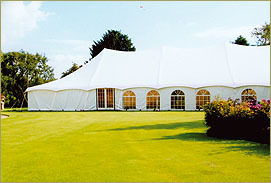 Yes in most cases we can erect a marquee on any surface, either grass or hard standing depending on the lie of the land. The freestanding structures have the advantage of having no guy ropes and are therefore ideal for confined spaces and hard surfaces. We provide PAT tested cables that can be linked to power points within your own home. Should additional power be required we can organise the supply of a generator. In any case Charlie or Jeremy can advise on these details after visiting your site. We recommend that heaters are hired with the marquees to ensure that the marquee is comfortable at all hours of day and night and to combat any weather changes. Our heaters come with adjustable heating so that you can alter the temperature inside the tent at your discretion. 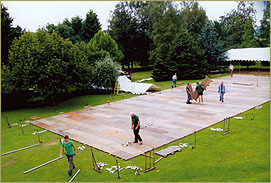 In most cases we would provide a wooden floor and carpet to give you a warm, professional finish to the marquee, but there are other options available and not every site requires a floor. We will provide you with a number for you to ring 24/7 in an emergency and a member of our team will be with you as soon as possible should you have any concerns on the day of your event. Alternatively you can have a member of our team on hand during the event by prior arrangement. If you have any further questions, please contact us on 01748 811511 or send us an email.